This app is intended for babies and their parents. It helps babies to fall asleep instantly. Uses classic monotonous sounds (lullabies) proven to be effective by generations of parents! Your babies will soon get used to it and when getting older even demand it and choose their own lullabies. The app becomes an integral part of the babies and their parent every day sleep routine. Even for older babies Baby Sleep Sounds helps to increase the overall noise level in the room, so that sudden urban sounds like traffic would not disturb your baby from sleeping. 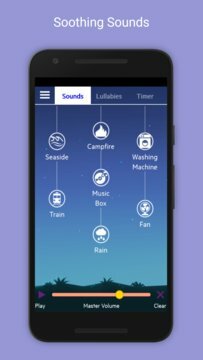 Baby Sleep Sounds is easy to use so that even your babies can start the lullaby. They just choose one of the available sounds. 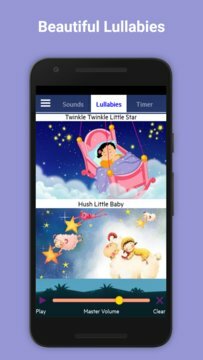 Each lullaby has a colour and a big image do that babies can find their favourite lullabies. A timer will automatically stop the lullaby when times run out. We also have different lullabies and sleep stories for kids.